Place, The Raised Brow, Voices, Zest! Kyoto’s Kamo River, in English, translates as Duck River. Modern bridges cross the wide, somewhat shallow stream, but a child or intrepid adult can also use a series of small stone turtle-shapes, hopping from islet to islet, moving from one side of the city to the other. Water birds with wide wingspans circle in widening gyres. We’re here so one of us, Corky, can show the other, Gus, the Japan she loves after many years of visiting and studying, working as an anthropologist. Japan can seem like a fantasy version of a country like the imagined Ireland, or the Brigadoon village appearing once every century. Trees have ropes around their trunks to remind people of a special spirit. Once I saw what might have been birdhouses that seemed scattered along the roadside. They were explained as homes for kami, or spirits. Houses and streets may be guarded by tanuki, ceramic badger-like mischief figures wearing hip flasks of sake and sporting oversized testicles. A few blocks east of the Kamo and its hovering birds we park our bikes on a street crowded with purposeful pedestrians and bike and auto traffic. We enter Gogo, an older, comfy, sepia-toned cave of a café inhabited by older and comfy regulars. A calmly industrious woman takes orders, which rarely vary. Everyone gets the coffee and toast combo, which the Japanese call “morning setto,” or morning service. The toast is Japanese in that it strives for perfection of a borrowed preparation. In the same way, pizza has recently been localized in Japan merely by perfecting the perfect Italian – by attempting to meet essential Neapolitan ideals, and then surpassing those standards. Japan has had great French restaurants, great Italian restaurants and now a trend in perfectionism has resulted in perfect pizza. One Tokyo pizza maker has won prizes in Naples. Ordinary pizza in Japan might display squid ink or chopped shiso leaf (an aromatic herb). It can be dressed with corn and pineapple and proclaimed “Hawaiian.” But these pizzas are essentially Japanese. They exist in dialogue and in tension with foreign traditions and they have earned the seal of approval from the commune di Napoli, “la vera pizza napoletana.” There is a shop in Naples that sells New York Style pizza. There should be one selling Tokyo Style pizza. 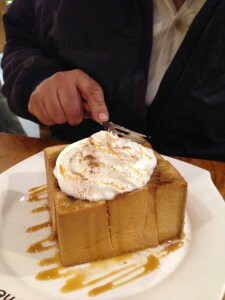 Toast in Japan is ubiquitous enough not to be noticed. Bread has been around a long time in Japan. It first came with the Portuguese missionaries and traders who arrived in the sixteenth century. In the early seventeenth century a book of recipes from Spain and Portugal was published in Japan, the “barbarians’ cookbook.” In it, guides to baking, involving applying heat from above and below introduced European techniques to Japan. The recipe itself is suggestive rather than specific: “knead flour with sweet sake and allow it to rise. Cover with a heavy blanket and after it has risen, cook it.” Other Portuguese baked goods such as casutera, a sweet cake named for the town of Castille, with eggs and sugars added are glossed in the 18th century as “confectionery.” The Portuguese are also credited with “katsu” or “cutlet” –the breadcrumb-crusted fried pork chop or filet and the bread from which panko breadcrumbs are made. At the time, bread was a very exotic preparation, but now, no one will suggest that “pan” (from the Portuguese word for bread, “pao”) or for that matter, casutera, is not Japanese. Sitting in Gogo, we are the only curly-haired customers as she explains Japanese food-ways. When Christianity seemed to threaten the soul of Japan, most missionaries were driven out. Those who stayed introduced useful items like matchlock guns, produced in Portuguese India on the island of Goa and brought to Japan in 1543. Trade was still permitted, but restricted to a tiny manmade island in Nagasaki harbor, called Deshima, where French and Dutch traders were permitted to conduct business. The Japanese had considerable curiosity about foreign things, and “Dutch leaning” (rangaku) attracted young elites to study western medicine and military science. The Portuguese had coffee–later to be the partner of toast in a Japanese breakfast.When Dutch traders provided coffee in the 1640’s it was first thought to be a medicine. One Nagasaki magistrate said, “It’s made from burned black beans and it tastes dreadful.” The Dutch traders’ taste for coffee spread from low to high, to the prostitutes they frequented who found it useful to keep themselves awake so customers might not slink off without paying- and to the Shinto priests at Dazaifu in Kyushu, where a Japanese merchant brought it as an offering to the gods. Coffee was to become the key public social experience, taking the place of tea as a more modern public beverage. The chaya, or tea house, provided a social space where gatherings of friends were flavored by tea, but the chaya disappeared as coffee cafes proliferated. The chaya did not serve coffee, and the café does not serve green tea. The first cafes, appearing in the Meiji era, in about 1888, were styled after the leather-chaired, tobacco-scented masculine coffeehouses of New York and London. By the early twentieth century, Japan was Brazil’s first targeted overseas market, and cafes proliferated. Some decades later, Japan became the third largest importer of coffee, which became ubiquitous by way of the new cafes, with at least one on every city block in Tokyo and Osaka by the Second World War. The cafes provided the social space that became absolutely necessary for merchants, students, flaneurs, flappers and literati. 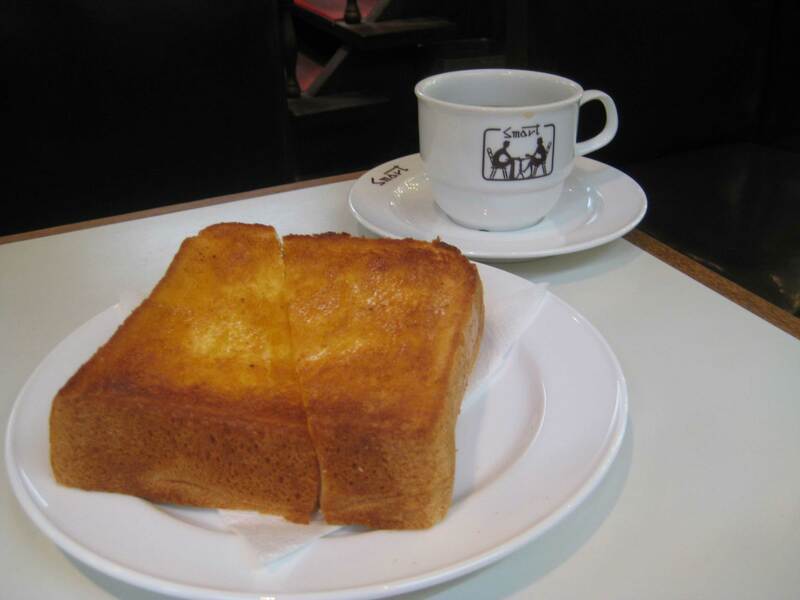 Toast had appeared in cafes in the early twentieth century, but its popularity was boosted by U.S.-donated wheat flour which flooded post-war Japan during the Allied occupation. Bread clearly now had a central place in the Japanese diet. 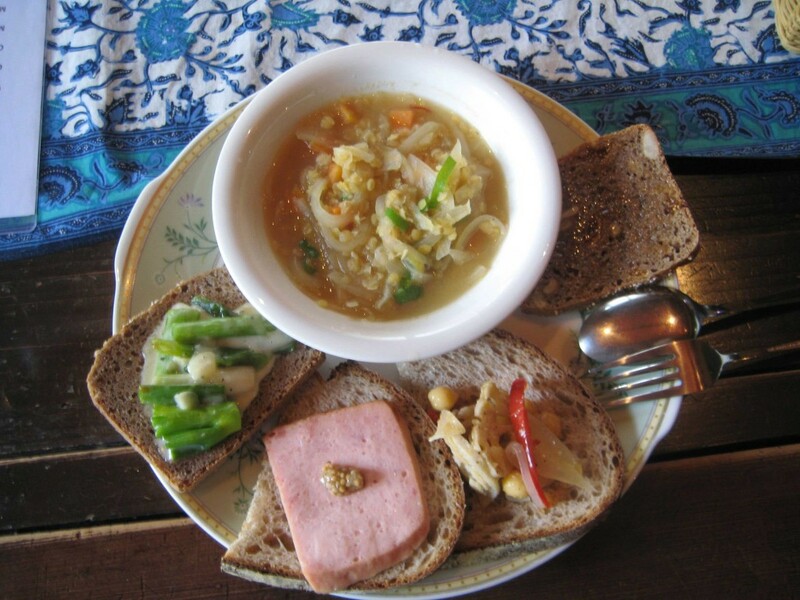 School lunches now contained bread instead of rice, and a breakfast at home might now have toast and cereal instead of rice and miso soup, since a traditional breakfast demands more preparation time and since most adults, both male and female, now work outside the home. Bread has long settled in everywhere, and regional variations of the café “morning service” or “set” have become objects of local pride. Some food tourists in Japan ride certain trains to enjoy the ekibento (station lunchboxes) of different towns. People who enjoy “toast tourism” visit places like Nagoya, a city to the northwest of Tokyo to enjoy its morning sets. The sumptuous café breakfasts, called “Nagoya morning” can include all manner of foods: macaroni salad, breakfast meats, smoked fish, French toast and a prize dish –Nagoya ogura toast, covered with sweet azuki bean jams, accompanied by yogurt and topped with fresh fruit. 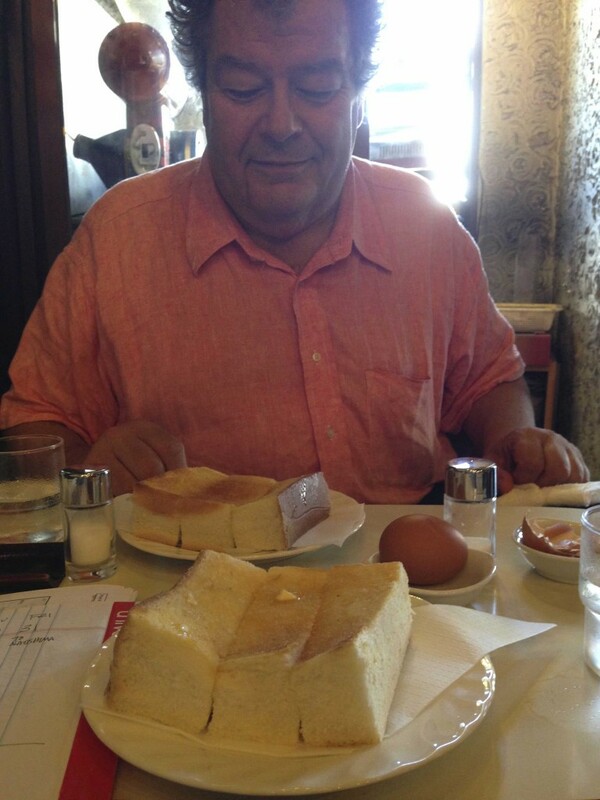 Fortified by this breakfast you could visit the Nagoya branch of Boston’s Museum of Fine Arts. Retired people on fixed incomes often wait until the end of the day’s morning service and arrive just before its conclusion, around 11am, to feast on what can then be their lunch, at very low cost. The massive size of these morning feasts seems to contradict images of aesthetic proportionality and delicacy in Japanese food. The 1980s, the booming period now called the “bubble years,” saw the development of a “normal” café set – coffee (or black tea, never green tea in a cafe) plus toast, an egg, and almost always a small bowl of shredded cabbage, carrots and a cherry tomato, sometimes with the peel cut to resemble rabbit ears. You could also have scrambled eggs, waffles, pancakes and croissants (in addition to the toast) and a hot Danish pastry with ice cream. The bread that becomes perfect Japanese toast is usually white, but artisanality in all things has achieved stunning variety in the bread experiences of Japan, from hand-kneaded multi grain and seeded varieties to the lightest of shokupan, or white, silky, marshmallow loaves—just made for the caramelization of toasting. You learn a lot about the power of the Maillard effect from toast. Aiming at the best, micro-bakeries produce a few excellent loaves a day. Like sushi in the film “Jiro Dreams of Sushi” or ramen in the film, “Tampopo,” bread can become the object of serious attention (called “kodawari”) for makers and conoisseurs. Kodawari is a word to conjure with: it can mean “perfectionism” or “diligence” or “passion for what you do” in any craft or pursuit. In bread it reaches great heights but sometimes you have to hunt for it. In Kyoto most people ride bicycles on sidewalks. Down a bustling street we wobbled our bikes to the left onto a smaller lane, and from there took another turn onto a cracked paved alley, at the very end of which is a dirt road with a wooden obelisk marked with the infinity sign. We followed that to another dirt path, left our bikes and approached a small, dilapidated farmhouse, incongruously abandoned in the middle of a major metropolitan city. A mysterious, Repo Man-like figure welcomed us and explained that he was growing herbs, and then disappeared again, into the shrubbery. We slid open the outside door, proceeded in to the genkan (entrance area) where we placed our shoes out of the cluttered way and opened the interior door, calling out something polite like “gomen kudasai” (excuse me) and Mr. Yokota emerged from the kitchen wiping his hands on a towel. We are there for the bread, and perhaps we are early, meaning between eleven and noon. Yokota-san’s bread is made almost daily but in small quantities, depending on the availability of the right (organic, small batch) flours, the generosity of air-borne yeasts and his energy. If he makes ten loaves it is a productive day. Taught in Japan by Austrian and German friends, Yokota bakes breads that are tight, dense, and full of seeds and nuts. They slice up very thinly and their moist density means they stay alive longer – if you can resist eating it all at once. The choices are few but intense: get a coriander rye or a fig bread, or a campagne made with graham flour. We stay for lunch. Yokota-san makes a delectable “lunch set”; open face sandwiches on his bread and a delicious soup (du jour, usually vegetable). Adding to the experience is the café area, with a capacity of about eight at a long, low table. We sit on zabuton (flat pillows). We watch the light through the large window on the “natural” (read: unkempt) garden. The silent, welcoming gardener is not to be seen. This is perhaps the most calming experience of food that can be imagined: the light is indirect, the mood serene. More European influence is seen in the perfect croissants of Japan – even in chain bakeries such as Patisserie Donq, a bakery founded in Japan in 1906, a branch of which we encountered on another bike ride in Kyoto. Corky first went to Japan in the mid-1960s, and, never having been to France and untried in the arts of French boulangerie, still knew a good croissant the moment she ate her first Donq and dipped it in her first (Japanese) nutty boule de café au lait. It remains in her memory as her finest French food moment, though she has been to Paris many times. We travel with the dictate of Calvin Trillin in our minds: there are no established meals, only eating experiences separated by the time it takes to get from one to the next. Brushing off the flakey crumbs of these croissants, we arrived at another café for its morning set, and the toast of the morning. These white milk-and-cream slices are not industrial Wonder or Sunbeam, but they do inspire nostalgia for mid-century American childhoods when even these breads, slathered with margarine, made us happy. Recently, missing those toasts we settled in at a Korean café in Boston where lessons learned from Japan show up, as is often true, shouted loudly: here the toast was 3-4 inches tall, called “brick toast,” and soaked with caramel syrup and topped with maple syrup, resembled the thick sweet Bostocks of French patisseries even more than they do the real, quietly wonderful, toast of Japan. Gus Rancatore was raised in New York and New Jersey and came to Boston to finish college and make ice cream. He opened Toscanini’s in 1981. Gus considers toast an entry-level drug to pizza. Corky White still considers herself a Minnesotan after many many decades in Boston but prefers sushi to hot-dish. Corky teaches Japanese studies and food anthropology at Boston University and thinks the best toast is Japanese. Gus Rancatore was raised in New York and New Jersey and came to Boston to finish college and make ice cream. He opened Toscanini’s in 1981. Gus considers toast an entry-level drug to pizza. Corky White still considers herself a Minnesotan after many many decades in Boston but prefers sushi to hot-dish. Corky teaches Japanese studies and food anthropology at Boston University and thinks the best toast is Japanese.